Embroidery machines generally have their own built-in designs. However, you might want your own personalized creations. This is where StitchArtist from Embrilliance comes in. 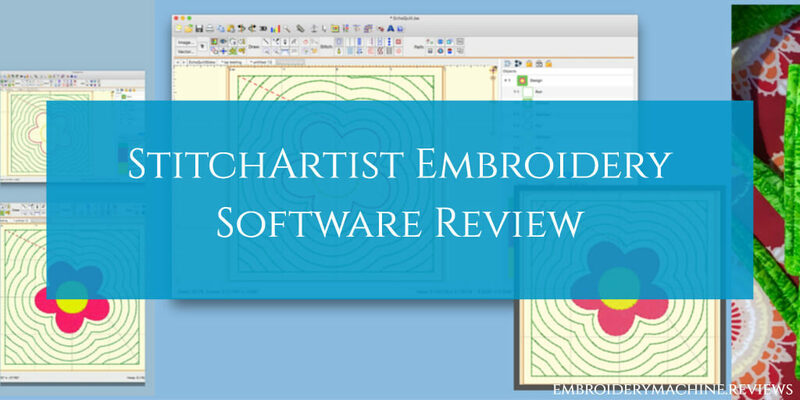 StitchArtist is a standalone software program allowing you to create and digitize embroidery designs in simple, easy steps. It’s compatible with both Windows and Mac PCs, and suitable for use with most embroidery machines. The full Stitchwork programs let you use existing artwork or draw your own. You have complete control over the shapes and the type of stitches you use. You determine their size, color and placement, and StitchArtist will then generate the stitches for you. This versatile program has been designed with ease of use in mind. It’s a tool which allows even beginners to create designs using software (usually called digitizing). It takes away the difficulty normally associated with this type of design. The software has simple-to-follow steps, allowing you to concentrate on your creativity. The user guide describes all the basics you need in detail. 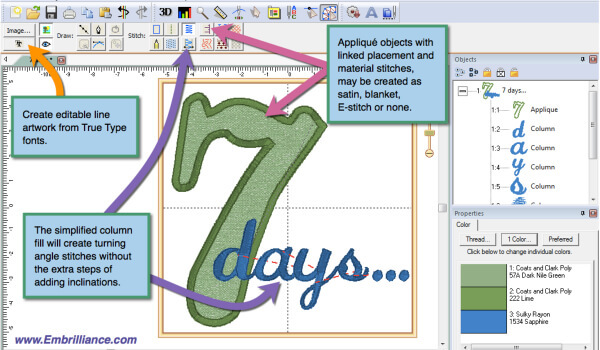 It allows you to use a single mode to complete all the separate tasks associated with embroidery design. This is a departure from many other digitizing programs available on the market, and a welcome one. It will let you draw, edit, and set stitch style, width, and color. 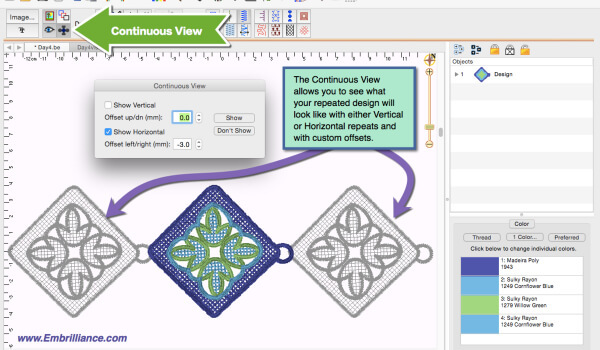 You can adjust the size of your design and set the sequence for stitching. StitchArtist comes in three progressive levels. This entry level program is aimed at someone who embroiders for a hobby. It’s reasonably priced and you won’t need a degree in computing to use it. It has a limited amount of stitches and the associated properties for them. This means you won’t need to follow an inordinate number of steps to create a design. The program includes applique, simple filled shapes, running stitch design, and backgrounds. It has all the elements needed to bring together a composite design. Level 2 comes with Level 1 included. It is aimed at the slightly more experienced embroiderer, with a basic knowledge of digitizing designs. It allows you to create logos and gives more freedom for creating unique designs. It has more tools than Level 1, and there are more stitch types and options to choose from. Level 2 will work in conjunction with some imported file formats, allowing cross-purpose use. These include some cutting files such as .FCM and .studio, or files such as .SVG art. Level 3 comes with levels 1 and 2 included. It’s aimed at the embroidery design enthusiast. It’s also suitable for users wanting to create commercial embroidery designs. It builds on the features offered in the previous levels. It allows for more advanced design incorporating items such as QuickStyles, Styles, Carving Lines, and an eyelet tool. It also has graphical operators including Cut, AND, Flatten, Inflate/Deflate, Union, Break, and Re-Construct. You also have access to content which expands what you have by using publishing embossed effects and motifs. Each stitch type has all the properties you need, and operations such as vector support and export have been added. You can draw .SVG and cutting machine designs. The controls allow for design in the way you choose. The program even has a tool which outlines existing designs automatically. Easy for use by beginners. Progressive functionality through the different levels. Can be used as a standalone product, or in conjunction with other Embrilliance programs (which are great!). If you only buy Level 1 you’ll soon wish you’d bought all three levels. Level 1 is far too basic for anyone who already has embroidery design experience. Generally, you begin by importing an image to be used as a background. This is usually a piece of artwork to be designed and embroidered. Following this, shapes are created to be stitched on the artwork. The shapes, the stitches, their properties, and the order they are stitched in are all created by you. You can change your mind at any point during the design process. All you need to do to alter a detail is click on the appropriate function button. 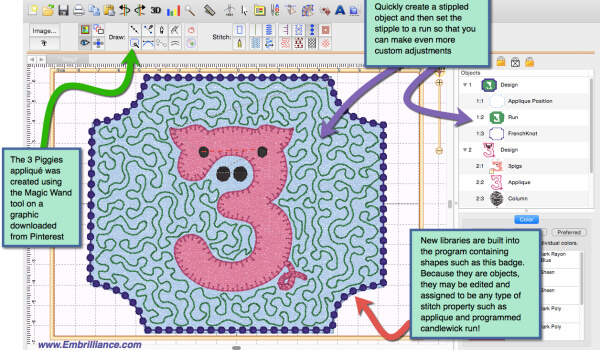 The program works with the Bezier model for shaping, a format people creating embroidery designs are familiar with. If you don’t know what this is, there are online manuals which are there to help. They can be accessed at http://embrilliance.com/downloads. The main focus of this software program is the ability to create embroidery designs in a straightforward, easy way. The different levels allow it to be used by absolute beginners who embroider for a hobby. All three levels are suitable for those using embroidery designs for a small business or commercial use. It’s the perfect, affordable program to learn how to digitize from the base level upwards. The instructions and design are simple and easy to follow. Introducing Embrilliance StitchArtist Level 1 - Create your own embroidery designs without breaking the bank!